My life isn't a chit to be used to bludgeon people to silence on either side. If you think the U.S. should stay in Iraq, don't drag me into it by claiming that somehow my death demands us staying in Iraq. If you think the U.S. ought to get out tomorrow, don't cite my name as an example of someone's life who was wasted by our mission in Iraq. I have my own opinions about what we should do about Iraq, but since I'm not around to expound on them I'd prefer others not try and use me as some kind of moral capital to support a position I probably didn't support. Further, this is tough enough on my family without their having to see my picture being used in some rally or my name being cited for some political purpose. You can fight political battles without hurting my family, and I'd prefer that you did so. So it goes. Andrew banned me from his site a long while back for my intemperate language on certain issues, such as the war. Ironic in retrospect. But for those who knew me and feel this pain [of his death], I think it's a good thing to realize that this pain has been felt by thousands and thousands (probably millions, actually) of other people all over the world. That is part of the cost of war, any war, no matter how justified. If everyone who feels this pain keeps that in mind the next time we have to decide whether or not war is a good idea, perhaps it will help us to make a more informed decision. Because it is pretty clear that the average American would not have supported the Iraq War had they known the costs going in. I am far too cynical to believe that any future debate over war will be any less vitriolic or emotional, but perhaps a few more people will realize just what those costs can be the next time. Ain't gonna happen, but I guess it's a nice thing to tell yourself when preparing to die. Since Andrew himself raised the topic, I suppose it isn't politicizing his death: People preparing to go to war never ever weigh the costs in human suffering of the war they are about to start. Instead they weigh the possible suffering of some imaginary future event that they think they're averting, or they weigh the suffering caused by some action of the enemy, even if that suffering was not very great or not inflicted on the people choosing to go to war. People deciding to go to war talk about any potential casualties only as it relates to their own forces, not among the civilian populations who die and are wounded in far greater numbers than combatants, in all wars. And they talk about casualties in their own forces as costs which we must bear, linguistically equating death and maiming to a monetary expense, and not adding up the grief of the survivors at all. They know they can count on the survivors to support them, or at least most will, and those who won't they can safely label as grief-stricken, that is, out of their minds. They know they can count on most survivors to support them because otherwise those survivors would feel that their loved one died in vain, and no one wants that. No one wants this. But this is all you get. 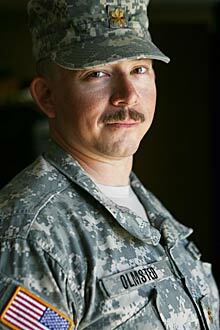 Major Andrew Olmsted and Captain Thomas Casey were both killed when we were ambushed [in Diyala Province]. They both displayed tremendous courage under fire. I am proud to have served with them. They will be greatly missed. We were all blessed to have known them. They will always be my brothers in arms. "We estimate that between March 18, 2003, and June, 2006, an additional 654,965 (392,979–942,636) Iraqis have died above what would have been expected on the basis of the pre-invasion crude mortality rate as a consequence of the coalition invasion. Of these deaths, we estimate that 601,027 (426,369–793,663) were due to violence." Except with respect to whether these deaths will lead to another 9/11, do any Americans talk about them? I was saddened to hear the news. Andy and I had exchanged email correspondence in the past and I interviewed him at my blog back in 2006. I hope that bloggers respect his wishes and don't politicize his death.